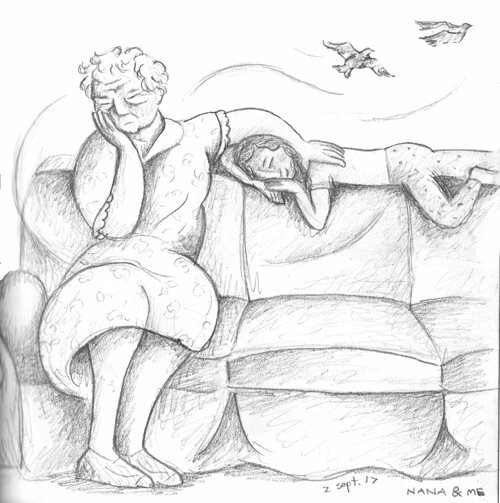 Here is a rather personal pencil drawing I did a few months ago – a self-portrait, from memory, of myself as a child with my maternal grandmother. If you are familiar with my art, you have met Nana Jean before, as she appears in many of my paintings. 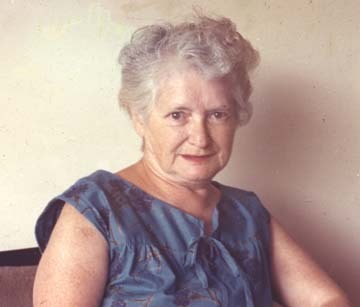 Regina Loewe, as she was named at birth, had a profound influence on me. The daughter of a successful tailor, she was born in Hungary and in 1912, emigrated to America alone at the age of 18. She became a milliner, sewing hats for Lord & Taylor, and was a talented seamstress. Raised as an orthodox Jew, Regina was the only person in her family who escaped Hungary before the Holocaust. Everyone perished, presumably deported to Auschwitz, as so many Hungarian Jews were. (According to the Yad Vashem Holocaust Memorial Museum in Jerusalem, over 550,000 Jews perished in Hungary alone.) Regina never saw her parents, sisters, aunts, uncles or cousins again. She also suffered the abandonment of her husband many years later, and raised her three children alone. Apart from my parents, Nana Jean was my closest relative as a child. She lived nearby, and I spent a great deal of time with her, often sleeping over at her house. Nana cooked and baked with me, and sewed clothes for me and my dolls. We did jigsaw puzzles together, and on New Year’s Eve, we watched Cinderella on TV. I adored Nana, and I’m sure the feeling was mutual. But I also sensed a deep well of grief in my grandmother. She never talked about it, but I felt something mysterious in her, like a great, black pond. Instinctively I knew I could not understand. I also sensed that my presence was healing to her. Perhaps the love of a grandchild was sufficiently different from all the other family relations she had lost. Whatever the reason, I thrived on Nana Jean’s affection, and I felt like I helped her in return. Every now and then, she even laughed. But often she was lost in thought, placing her hand to her cheek and sighing. Nana Jean was really nice to me. She allowed me to climb on the back of her couch. I remember lying there with one leg hanging down while she rubbed my back. I was very ticklish as a child, and also starved for touch. I wriggled restlessly until Nana Jean’s warm hand soothed me. But when I looked up, I could see Nana Jean was far, far away in her thoughts, and her face was full of pain. I imagined her memories emerging like birds from a tree, fluttering away. Could I, with my childish devotion, make all Nana Jean’s bad memories fly away? I secretly wished I could, even as I selfishly enjoyed the back rub. In that moment, I experienced the complexity of mixed emotions, as past and present, pain and pleasure mingled together, crystallizing into this memory that has stayed with me ever since. I did the drawing the day after her last yarzheit. Regina Loewe Werner, of blessed memory, lived from 1894 to 1985. I will never forget her. This entry was posted in Image of the Week, Jewish Learning. Bookmark the permalink. I was so interested in reading this story about your Nana, because I had two nanas that I felt close to during my childhood, as much as I felt close to any human. You have written a beautiful story of your bond with Nana and it allows thoughts of my Nanas, having read your own. Thank you for giving me the opening to remember them today. Thank you Marilyn! We who have had loving grandmothers are so fortunate . . . as are they, for having us.